TALLADEGA, Ala. — A jack getting stuck under the car of Joey Logano on his first stop didn’t stop him from rallying back to score the victory in Alabama. Martin Truex Jr. led the field to the green flag at 2:22 p.m. Brad Keselowski got a run on him going down the backstretch to lead the first lap. Truex worked his way up alongside Keselowski in Turn 1 to take the lead for the first time on the 13th circuit, only to give it back to Keselowski a lap later. The No. 2 Penske car spent most of the run blocking all three lanes, which allowed Chase Elliott to get under him in Turn 3 and take the lead on lap 26. Keselowski regained it briefly two laps later before Elliott powered by on the top in Turn 1 to regain the lead back on lap 29, only for Keselowski to take it back on lap 32. Green flag stops started on lap 37 with the first wave of cars hitting pit road. Race leader Keselowski was among the second wave the following lap. After the third wave pitted, the lead cycled back to Keselowski. Teammate Logano was penalized for removing equipment (jack) from the pit box under this pit cycle. Truex’s Chase hopes went up in smoke when his car went up in smoke in Turn 2 on lap 41. The race restarted on lap 47. Attempting to block Elliott’s advance, Keselowski found himself without drafting help and Elliott took back the lead, only for Biffle to get a run on him going into Turn 1 to take the lead on lap 49. Elliott worked his way back to the lead by dropping to the bottom lane going into Turn 1 and driving under Biffle on lap 78. Another wave of cars started pitting the following lap. The lead under the cycle went as follows: Elliott, Hamlin, Edwards, Annett and Keselowski. A three-car wreck involving Biffle, Jeffrey Earnhardt and Casey Mears on the frontstretch brought out the second caution with 74 laps to go. The next run didn’t last a lap because the caution flew the same lap as the restart with 39 to go for a big piece of debris on the backstretch. Going back green with 35 to go, the race was slowed down with four to go by Kasey Kahne wrecking in Turn 3 and Alex Bowman going for a spin through the tri-oval grass coming to the line to get two to go. 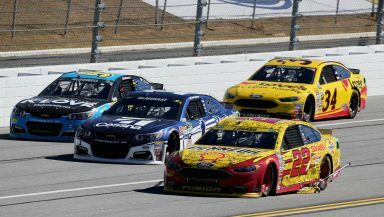 Restarting in overtime, Logano had to hold off Brian Scott to score the victory. It’s his 16th career victory in 287 Sprint Cup Series starts, second of 2016 and second at Talladega Superspeedway. Scott brought his No. 44 Richard Petty Motorsports Ford home to a runner-up finish, his career-best finish and first top-10 finish of 2016. Hamlin rounded out the podium in his No. 11 Joe Gibbs Racing Toyota. Kurt Busch finished fourth and Ricky Stenhouse Jr. rounded out the top-five. Kyle Larson finished sixth, Kevin Harvick finished seventh, Aric Almirola finished eighth, Austin Dillon finished ninth and AJ Allmendinger rounded out the top-10. Logano, Jimmie Johnson, Harvick, Matt Kenseth, Edwards, Hamlin and the Busch brothers advance to the Round of 8 while Austin Dillon, Elliott, Keselowski and Truex go no further in the Chase. The race lasted three hours, 11 minutes and 38 seconds at an average speed of 159.905 mph. There were 31 lead changes among 14 different drivers and six cautions for 25 laps.